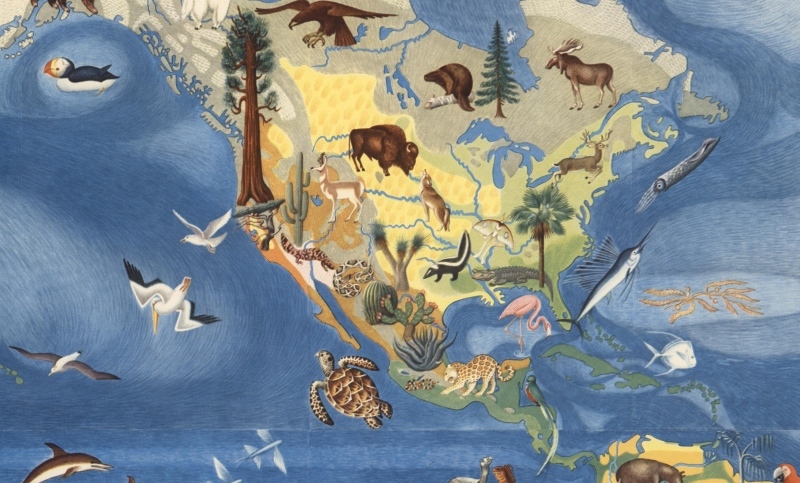 In an earlier post – Mexico in the USA: Pacific fauna and flora mural in San Francisco – we looked at the beautiful (and very geographic!) mural by Mexican artist José Miguel Covarrubias (1904-1957). Covarrubias had a lengthy commercial art career as an illustrator of books, designer of theater sets and costumes, and as a caricaturist for magazines including Vanity Fair and The New Yorker, but at heart, he was very much a geographer, with a healthy side-interest in ethnology. In the mid-1920s, he moved to New York, where he fell in love with a young dancer and choreographer Rosa (Rosemonde) Cowan. 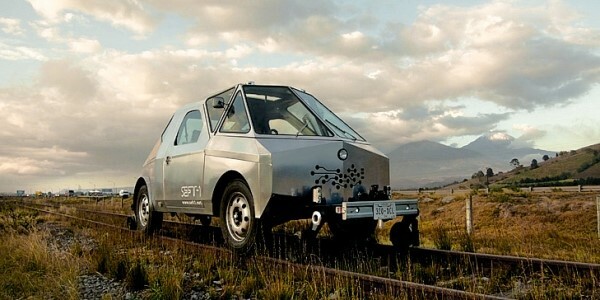 The couple traveled together to Mexico, the Caribbean, Africa and Europe. In Mexico, Rosa met Miguel’s friends, including Diego Rivera and his wife Frida Kahlo, and was introduced to photography by Edward Weston. Miguel’s illustrations for advertisers, especially the one he painted for Steinway & Sons pianos, helped speed up the inclusion of Bali, Indonesia, on the world tourist map. Miguel’s piano artwork won the 1929 National Art Directors’ Medal for color painting. After Miguel and Rosa married in 1930, they used the prize money to take an extended honeymoon to Bali. The couple loved Bali and quickly became interested in the local language and culture. Three years later, in 1933, Miguel was awarded a Guggenheim Fellowship, and the couple returned to Bali, also visiting Java, India and Vietnam. 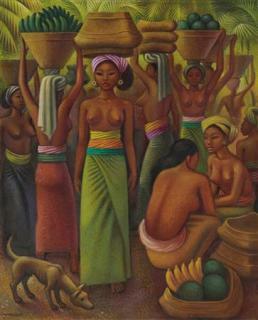 Miguel’s art and Rosa’s photographs were key ingredients in the success of Island of Bali (1937). The book was released in New York at a particularly propitious time, just as interest in far-flung tourism was being fired up by travel firms. The book coincided with, and refueled, a craze among well-to-do New Yorkers to visit the island. The rest of the world soon followed, and Bali’s tourist future was guaranteed. Island of Bali is “still regarded by many as the most authoritative text on Bali and its fascinating people. Included is a wealth of information on the daily life, art, customs and religion of this magical ‘Island of the Gods. '” For more about the book, see Miguel Covarrubias: Island of Bali. on Chris Morrison’s blog Thirty-Two Minutes. Miguel Covarrubias’s later books included Mexico South (1946); The Eagle, the Jaguar, and the Serpent – Indian Art of the Americas; North America: Alaska, Canada, the United States (1954); and Indian Art of Mexico and Central America (1957). An art exhibition entitled “Mexican Volcanoes” is opening in Mexico City next week. The show opens on Tuesday 21 April, at noon, at the offices of the Mexican Society for Geography and Statistics (Sociedad Mexicana de Geografía y Estadística) at Justo Sierra #19, in the Historic Center of the city. 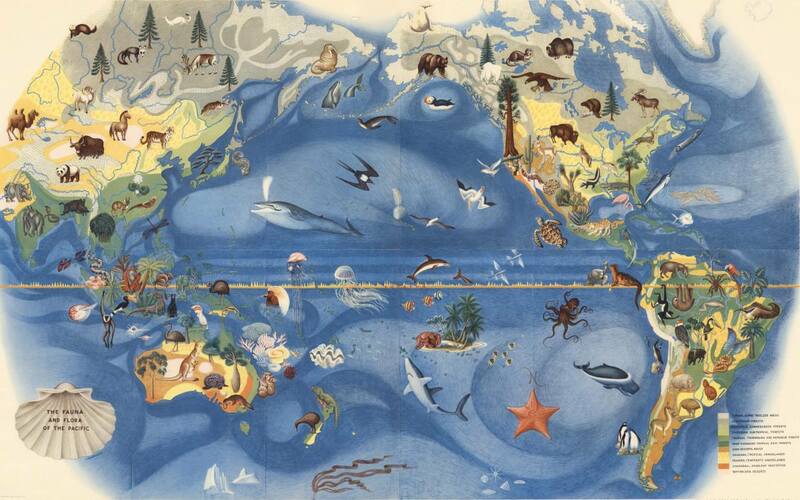 The Society is one of the world’s oldest geographic societies, having been founded 18 April 1833. (The Royal Geographical Society in the U.K. was founded in 1830; the National Geographic Society in the USA was founded in 1888). This exhibition, which will close on 29 April, is being arranged by Lewinson Art, a Mexican art firm that specializes in promoting artists via a virtual gallery and exhibitions. 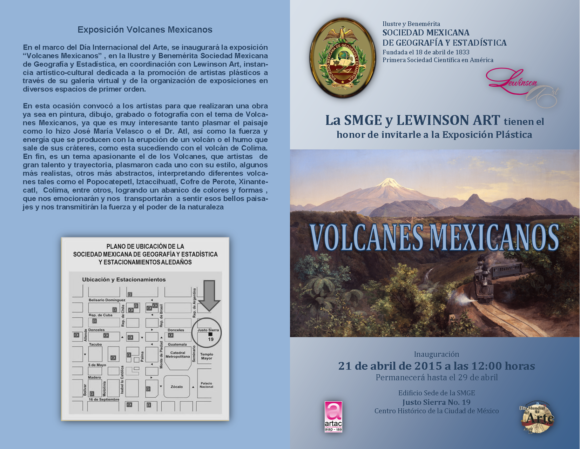 Artists were invited to submit works (paintings, drawings, engravings, photographs) relating to the subject “Mexican Volcanoes”. 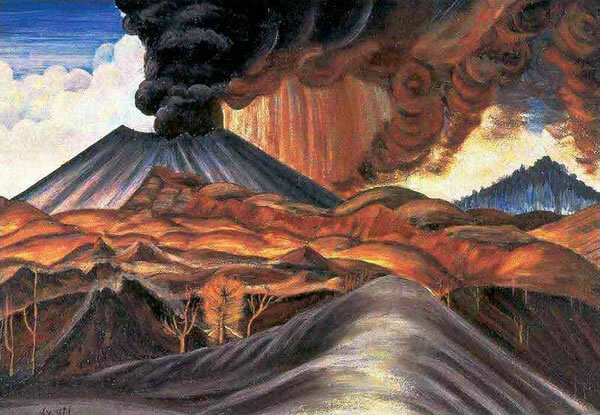 Historically, Mexico’s volcanoes have been especially fertile ground for Mexican artists, from the great landscapes of José María Velasco to Casimiro Castro and the colorful and energetic “aerial landscapes” of Dr. Atl (Gerardo Murillo). 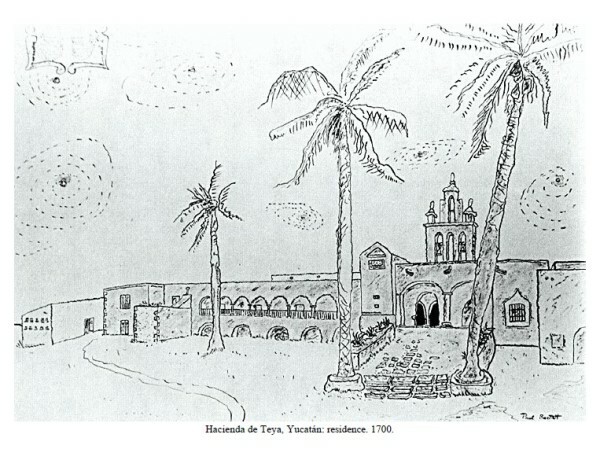 Agustín Aldama, Mercedes Arellano, José Luis Briseño, Rosi Calderón, Argelia Castañeda, Becky Esquenazi, Gabriela Estrada, Tere Galván, Gabriela Horta, Ana Gabriela Iñiguez, Débora Lewinson, Manuel Martinez Moreno, Nadine Markova, Ausberto Morales, Francoise Noé, Merle Reivich, Fernando Reyes Varela, Homero Santamaría, Arcelia Urbieta, Ariel Valencia , Primo Vega and Lucille Wong. 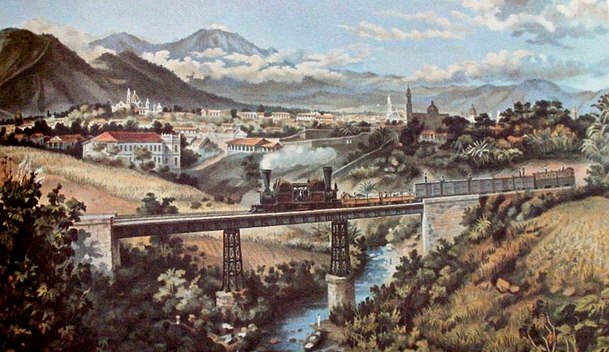 The volcanoes depicted in the show include Popocatepetl, Iztaccihuatl, Cofre de Perote and the Nevado de Toluca (Xinantecatl). The city of Toluca (population 1.8 million), the capital of the State of México, was in the news recently as the site for the tri-national meeting between the heads of state of Mexico, the USA and Canada to mark the 20th anniversary of NAFTA. Nestled away inside the city, away from its burgeoning factories, is the former city market. The market closed in 1975. 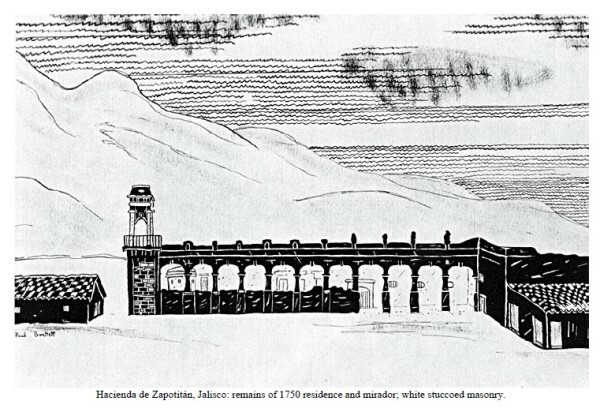 Plans to demolish it were forestalled when renowned Mexican artist Leopoldo Flores stepped up with a plan to restore the market building, which dated back to 1909, into an artistic gem housing a botanical garden. The market’s original windows were replaced with large glass murals, comprised of half a million pieces of glass and covering a total area of more than 3,000 square meters. The revamped building, now known as the Cosmovitral, was reopened in 1980. In 2007, the Cosmovitral narrowly missed being named one of the 13 man-made wonders of Mexico. The centerpiece of the Cosmovitral murals is the stunning image entitled Sun Man (Hombre Sol). Possibly the world’s best decorated glasshouse, the Cosmovitral houses over 500 different plants from around the world and has become one of the city’s single most popular tourist attractions, though rarely visited by foreign tourists. Where? 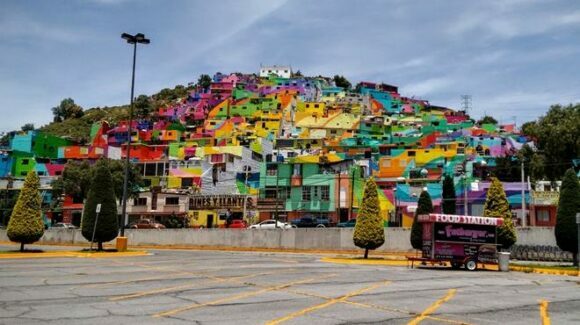 The Cosmovitral is located in downtown Toluca at the intersection of Juárez and Lerdo de Tejada streets. Guided tours are available. When? It is normally open Tuesday to Saturday, 10 a.m. to 6 p.m.; Sundays 10 a.m. to 3 p.m. Admission? Tickets are 10 pesos (less than a dollar) for adults, 5 pesos for children. Guided tours, mostly to explain the Cosmovitral’s stained glass, are available. Art exhibitions are hosted regularly.